Tell us something about yourself, that not many people know about you. I love stripes! On bedlinen, cushions, tea towels, table cloths – and mainly my clothes. I must have a gazillion Breton striped tops and dresses! I think (read: wish!) I was Coco Chanel in my previous life – or a sailor 😉 They just make me happy, calm and comfortable. When was your first book published and how was the process of getting it published? My debut novel, “The Cosmopolitan Islander”, was published in November 2015. I self-published via Amazon’s company CreateSpace. One of the things holding me back from starting to write years ago was the worry of not being accepted by a publisher and the struggle to get past the piles of other manuscripts and rejection letters, through that tiny keyhole to become a published author. Luckily, things have changed so much in the industry over the last 10 years with the advent of the e-book making publishing much more accessible. This does not mean self-publishing is the easy route. It was definitely a steep learning curve! There are lots of new challenges and potential pitfalls every day. I like having control of the process, but it also means a lot of work for a one-woman-army. Plus, self-publishing is not the gold rush it initially was. There are so many self-published books out there now of varying quality, it can be very difficult to stand out from the crowd. Self-publishing is a tough, but fun challenge. When did you first know, that you wanted to be an author? Words and playing with them have always been a great interest of mine. I learned to read and write at the age of four and I haven’t stopped since. 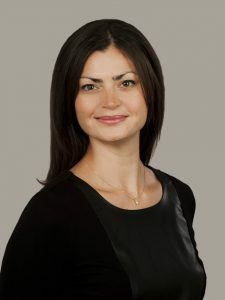 I am a linguist at heart, grew up in a bilingual family, and speak four languages. I have written for many years, but it was primarily non-fiction; academic papers and corporate communication. Some years ago I had a career break during which I reflected on what to do with my life and what would bring me happiness – a lot like Chloe, the protagonist in my debut novel. I did not have the courage or financial stability back then to take that first step which I was finally able to do years later – starting with a few scribbles in a notebook and a writing course at London School of Journalism which whet my appetite further. When we moved to the island it opened the door for me to the opportunity of being more serious about my writing. I was lucky to become a writer here for Gallery and Agenda Magazines, alongside working on my novels and running my consulting business. Writing is like dreaming in a waking state. You tap into those deeper layers of your imagination and emotions to create a world. My whole cast of characters and their stories are inspired by lots of different people and events – real as well as fictional. TV series, films, current and historical events, friends, family, random strangers in the street, park, restaurant or when travelling – they have all inspired me and triggered different scenes and feelings I could channel into my novels. I was shamelessly hooked on the series Scandal when I started writing Desert Skies, Rebel Souls which is where I got Olivia’s name from 😉 I’m also a big Outlander fan and was keen to emulate the amazing chemistry between Claire and Jamie. I hope I’ve managed to channel even just half of their passion into my characters! I believe most people have a story in them, but few get the chance to express it. It takes time and dedication – and a bit of wordsmithing skills. But go for it! Nothing ventured, nothing gained is my motto. Persistence is the key throughout – from actually completing a piece of writing to getting it out there to potential readers. Whether you are self-published or traditionally published, authors are expected to promote themselves and their books today. The key thing to remember is: Sell one book at a time. When I was knocking on the doors of bookshops, a supportive soul at Daunt Books in London told me: It’s a marathon – not a sprint. I have found that a really helpful mantra. 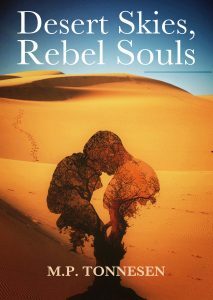 Desert Skies, Rebel Souls is a unique coming-of-age story of self-discovery and rebellion. It is set in the Middle East and follows the journey of a young woman, Olivia, from Denmark to a region rich in history, culture, conflict and passion. A whirlwind romance with a local kibbutznik, Chaim, takes a dramatic turn, leaving her caught between countries, belonging nowhere, and with the love of her life in danger far away. She explores magnificent historical sights and cultural experiences, encounters the dangers of travelling unaccompanied in a male-dominated society, as well as questions the concepts of hatred, fate, war and peace. It is a bittersweet love story set under the desert sky, against the backdrop of music and key events of the nineties – to be enjoyed by adventurous globetrotters and readers longing to escape. “Desert Skies, Rebel Souls” will be released on 10/11/17, and is available for order now from my website mptonnesen.com I hope you will enjoy it! One of the few books to which I keep returning is The Sense of An Ending by Julian Barnes. I really enjoy his musings around time, being and novels, as well as his style and language which are very succinct and even melancholic. I look forward to watching the movie version starring Jim Broadbent! Swing Time by Zadie Smith. I had the great pleasure of meeting her in Denmark this summer at Louisiana Literature Festival. She not only signed her own book, but also my debut novel! It was a surreal, but magical fangirl moment. What is your favourite reading snack or accessory? My own mix of organic almonds and raisins – and dark chocolate, of course! If anything was possible, what could then be a perfect day for you? What would you do, where would you go? I would lounge in the sun on an exotic island, reading books, eating delicious food and just looking at the mesmerising endless shades of blue as I listen to the calming sounds of the sea. She wrote “Goodbye” with his blood. “Desert Skies, Rebel Souls” is a beautiful travel story about rebelling against the expectations of others, about love and clash of cultures. We follow the main character Olivia, a Danish girl, on her travel to Israel. She is fighting to find her own way through life instead of following the norms and expectations of her family. In Israel she connects with a young man, who becomes a very important part of Olivia’s discovery and her road to self-reliance. The descriptions of the places that the main character Olivia visits are written so well and so beautifully that I felt an urge to go see them for myself when reading about them. Yet I can relate to the insecurities that follow young women travelling on their own and do not miss that part of travelling. Like in The Cosmopolitan Islander, M.P. Tonnesen manages to write a believable main character, whom I both like and dislike; which is a strength I really appreciate. It gives a depth to the characters and makes them seem more real to me. I love when characters are flawed and I love a good story about personal development. 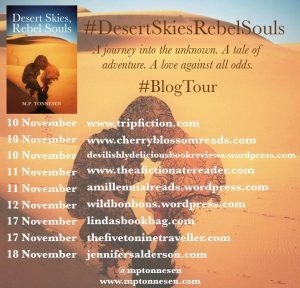 If you enjoy a good love story, reading about travels and to get the sweet feeling of wanderlust from a book, I can recommend you read “Desert Skies, Rebel Souls”. It will take you places if only you let it. The book is an easy-read that wants to make sure the story is told just right, in order to give the reader a great reading experience. OKay, so how do you get your hands on it? “Desert Skies, Rebel Souls” is released today and is thus available for purchase right now! You can find the kindle edition right here, but it is also available for other e-book channels. As mentioned in her interview it is also possible to order a physical copy from her website, but this can also be done from your preferred Amazonsite. On a final note I would like to give my heartfelt thanks to the author for letting me interview her and for sharing herself with me and you guys. I want to thank her for sending me an ARC of the book and I am grateful that she was interested in hearing my thoughts on her book baby “Desert Skies, Rebel Souls”. I sincerely appreciate working with her on this blog tour and wish her all the best!